This farmhouse is more like a farm-mansion with all of it's elegant, classic, and timeless details. 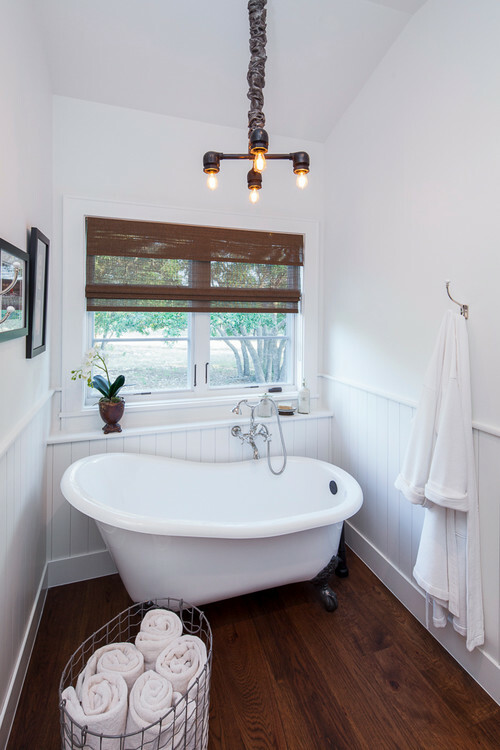 While it still boasts some of the country flairs you'd expect from a farm home like exposed beams, wood floors, a stone fireplace, and a clawfoot tub - it also has classical elements with a moderntwist. The living dining space is separated like a formal home, but the fireplace has a look through which opens the spaces right up to one another. The kitchen boasts stunning white cabinets and stone countertops, yet there's a twist with a big beautiful black island that really centers the space. The design of this home is unique and undeniably stunning. Take the tour and fall in love with it for yourself. 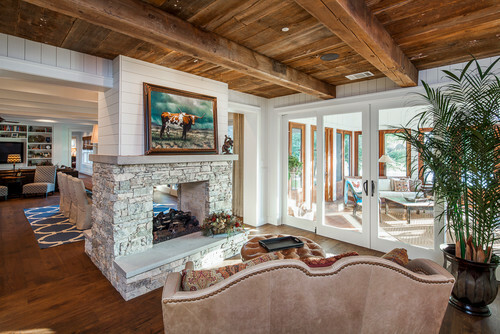 The contrast of the white-washed walls against the wood beamed ceiling is warm, and inviting. We also adore how the stone fireplace looks into the formal dining space - it's a nice twist on the traditional separate living-dining space. This kitchen is fit for any chef with a six range gas stove, massive refrigerator, and wine fridge that's bound to make any sommelier drool. The designers have played with contrast in the kitchen as well, juxtaposing the black wood island against light stone countertops and white cabinets. 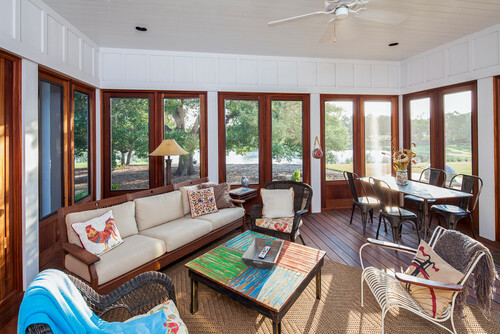 This sunroom is the perfect place to curl up with a good book and a cup of tea while you watch the sun fade. We love the mix of different styles of furniture because it makes this space feel informal and relaxing. 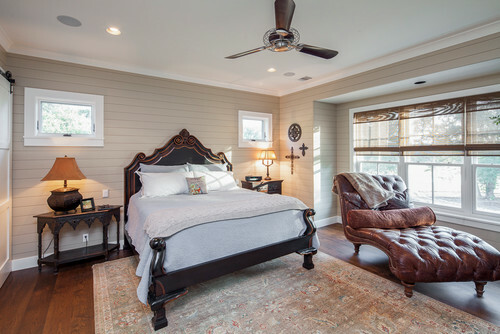 This bedroom is far from informal though - besides that luxe leather chaise lounge there's that massive carved wooden bed. We love the dark and masculine furniture pieces against the light walls and faded Persian rug. 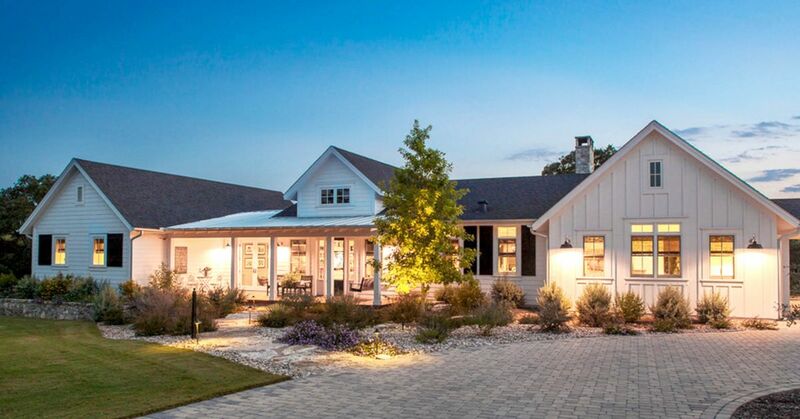 Obsessed with this elegant farmhouse? Share it with your friends on Facebook, Twitter, and Pinterest.